Managing cash flow is a business critical task yet it's an ongoing challenge business owners have. If you can relate to this, you’re not alone. According to research by the Australian Bureau of Statistics, half of all businesses throw in the towel in their first three years. 40% of business failures were attributed to poor cash flow. There are plenty of free resources that aim to help small businesses manage their revenue and expenses, but sometimes spreadsheets and templates aren’t enough. We asked Stacey Price, Founder and Accountant at Healthy Business Finances to share a few tips on how small businesses can better manage cash flow. and how to use budget templates to help your business stay afloat. Cash flow seems to be a common problem among small businesses. It’s reported that the average small business is owed $38,000. Why do you think it is such a common problem? Stacey: I think it’s because they don’t know their cash flow. They understand what profit is but they don’t know what cash flow and profit means. A business’s profit only shows income and expenses but often a business may buy assets that don't get recorded as an expense. Repayments on an asset for example often affects cash flow yet it's not always accounted for in an expense report. It’s easy to just focus on the revenue numbers and forget other expenditures but you can’t just look at profit and loss reports. If you’re working with an accountant, have them look at your profit and loss statements in conjunction with a cash summary. A cash summary shows everything going in and out. It identifies holes where cash may be leaking. It also helps you predict what you’ll need in the next few months i.e. staff salaries, superannuation…etc. 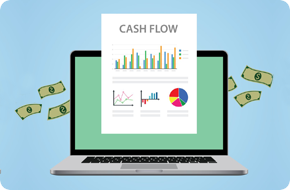 What can businesses do to better manage cash flow? Stacey: Build a relationship with your accountant. A lot of people have accountants but they probably see them once a year when it’s a tax time and the year is finished. You don’t want to spend 12 months leaking money. Ask your accountant or book keeper for a cash summary every month. Understand the invoicing process. This includes quoting, the terms of invoice, sending of the invoice and the follow up. People are great at sending invoices but not so good with follow up. Study the financial reports, not just the profit and loss statements. Learn what the numbers on a balance sheet will mean for your business for the next 2 months. Know where money is going and be ruthless with what’s not working. Budget templates and trackers are a popular solution for people looking to manage their finances better. What are your thoughts on budget templates? Stacey: I think they’re a great start but the problem we see with budget templates is that it gets created when people are excited. Once the excitement wanes, they rarely look at it again. Businesses change every 12-24 months and it is something that constantly needs to be reviewed i.e. if you start renting an office, your budget needs to reflect that. Run actual numbers and compare them to your budget. People set budgets but don’t know if they’ve achieved it. Take the time to review your numbers. Understand that one size doesn’t fit all. There isn’t one budget tracker that suits every business but a template is a good start. They should be tweaked for your business. Don’t limit yourselves to spreadsheets. Use what’s best for you to learn. We have people who use apps (i.e. Quickbooks, MYOB, XERO) or excel. Stacey works with small businesses, start-ups and entrepreneurs to help them understand what numbers mean. She covers things like business owner obligations, GST and other things business owners rarely learn. Disclaimer: This information is general in nature and does not constitute financial advice. In considering whether this information is appropriate for your needs, please seek professional advice from a financial advisor.